Huonggiang Hotel are located between Old Quarter and French Quarter, which is very easy to access many city attractions, such as tourist spots, offices, banking and shopping areas. Dong Xuan Market: 3km, within walking distance - 45minutes. US$ 20 for a minibus. Transfer charges payable direct to the hotel. Most of the rooms have a bath tub, heating, air - conditioning, international satellite TV, a fridge with several kinds of soft drink, a wardrobe, a coffee table, a desk and other facilities. The rooms have a FREE ADSL Internet (fast internet) connection. Huonggiang Street View Rooms are large and comfortably furnished with wooden floor. 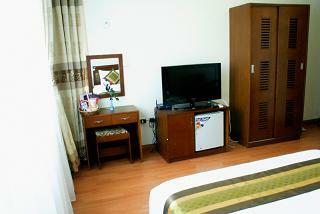 These rooms are the best in the hotel, all large and measuring 35 sqm. Huonggiang Hotel is located between Old Quarter and French Quarter, which is very easy to access many city attractions, such as tourist spots, offices, banking and shopping areas. • Requirements for late check-in after 6.00pm should be informed by email or phone before. - Cancelled booking 36 hours before the check-in time should be charged 50% of the first night amount.